This should infuriate many….not that it will, but it SHOULD. When the Capobiancos set out to adopt Veronica one of their strategies was to strike down the ICWA or the Indian Child Welfare Act. I won’t bother you with a long explanation of this law. By now most of us have come to understand it’s purpose and the reasoning behind it. But basically, it’s meant to protect Indian families and their children when it comes to adoption. The Capobiancos logic behind their campaign to destroy this law seemed somewhat reasonable in theory. It was that they wanted to open up adoption and make it racially blind. They wanted adoptions to have no basis on race whatsoever. And they saw the Indian Child Welfare Act as giving racial preference to Indians and therefore, racist. I don’t agree but I can see that there was some logic there. You see, it was Veronica they wanted so they formed a strategy. The ICWA was only a hurdle in their path. It wasn’t that this particular issue mattered to them but it was the thing they had to get past to get Veronica. Prior to, they probably hadn’t even heard of this law. But given it got in their way now, they had to set up a game plan. That game plan was to destroy the law. They didn’t care about the law or the people it was meant to protect. They didn’t even care what it’s intent was. They only cared that it was in their way with respect to their goal in that moment. So they set out to destroy it to get Veronica and came up with the whole ‘it’s racist’ mantra later. They came up with all the reasons for destroying it later to look as if they were truly being selfless. It didn’t matter whether they believed or supported their own hype. It was just what needed to be said to get there. They were like Kardashians advertising for QuickTrim. They didn’t need to buy their own product. That product didn’t even need to work. They didn’t need to believe it in. They just needed it to sell. They needed people to buy into their propaganda and support them in striking down parts of the ICWA so they could win. The Cappobiancos chipped away at the ICWA not because they believed in their fight or because it should have been done. They did it for no other reason than they could. And now they raise the Indian child whose culture they’ve helped to destroy. While Congress has yet to amend the ICWA, our collective effort surrounding Veronica’s case will indeed help ensure this situation will not happen to another child. As a matter of fact, it already has. We have been informed her case has already been used in several cases to block similar travesties from occurring…. If anyone would like to continue advocating for children being hurt by the ICWA, please connect with the following groups. It wasn’t that this issue itself mattered. The ICWA didn’t matter. Indians didn’t matter. Their plight didn’t matter. Even if the law was destroyed completely, it didn’t matter. Getting to keep Veronica was all that mattered. And if, after that happened, everything else crumbled and the world stopped turning, that just didn’t matter. So we, whether in support of Native Americans and the ICWA or not, are left to pick up the pieces and suffer the consequences. Whether you supported Brown or the Capobiancos, what’s left is the result of what they’ve done. And that should infuriate you. Whether you fought to strengthen the law or tear is apart, your fight wasn’t even recognized because some couple who it mattered nothing to swept in, did their damage and ran. If you didn’t support the law and wanted it dismantled, you worked with a couple whose heart wasn’t in the fight with you. They climbed up your back and trampled your heads as they stood on top of you as their platform then they took their prize and ran. They used you to make themselves more visible and their voices louder but they cared nothing for you, your fight or any of the related legislation. As a skeptic, one would think they’d just about seen it all and that almost nothing could hold any real shock value anymore. …And then one turns their attention back to the ‘Baby Veronica’ saga. By now the intentional misrepresentation of this case by the Capobianco camp comes as no surprise to most but there are just so many details that still keep rising to the surface of the muck that has been their adoption campaign. In surfing the web the other day, we noticed Facebook had added a feature. WHEN that was added we don’t know but it caught our eye. 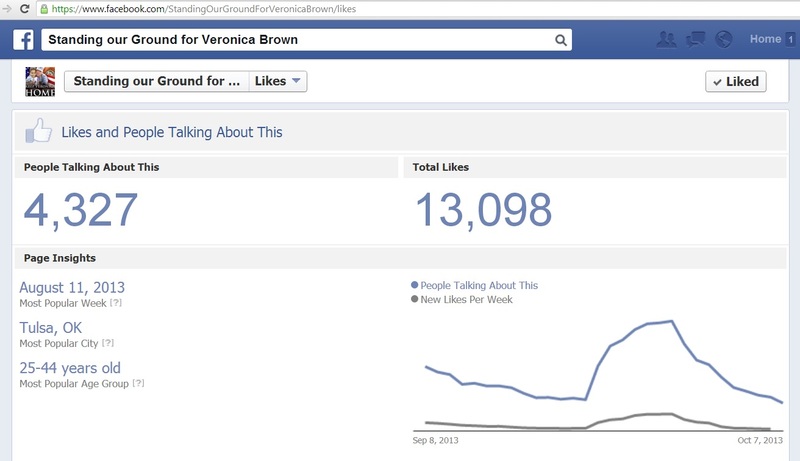 We knew rumors were rampant regarding the Capobianco’s page (Save Veronica Rose) and their ‘buying likes’. 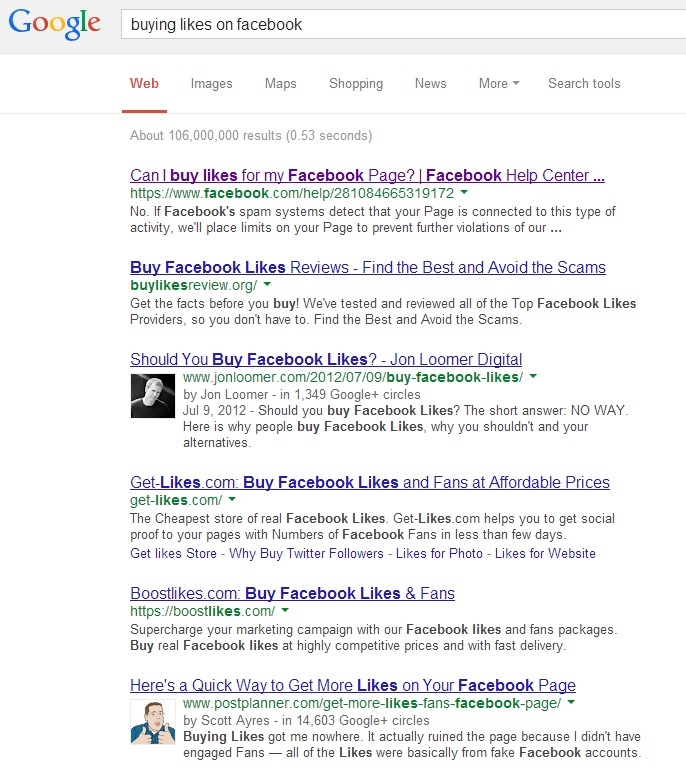 What is ‘buying likes’ you ask. For those who run pages on social media sites, the number of people who like a page speaks to the page’s popularity and reach. And in much the same way the latest craze catches on, if one sees that their friends or a lot of people like something, they want to be part of that, they want to like it too and see what it’s about. 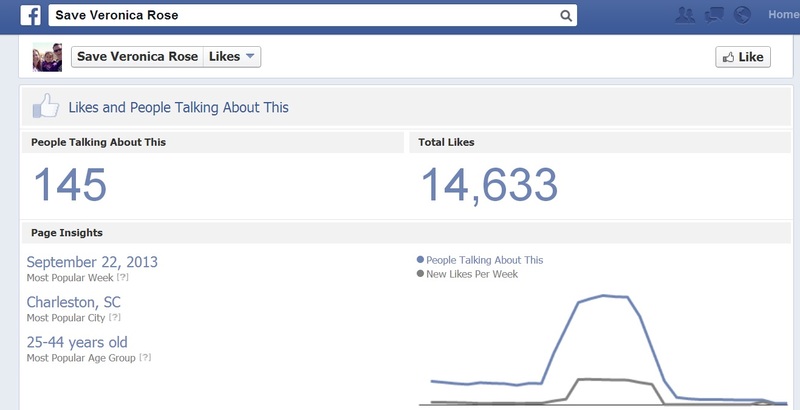 So as a page administrator the more likes you have, the more likes you attract. To have very few likes is almost the kiss of death to a page on Facebook. So a page administrator can go to any number of services that will net you hundreds or thousands of likes for a fee. Now these ‘likes’ though will usually come from fake accounts and from foreign countries (that being the dead giveaway). the dead giveaway. You see, we’d been led to believe that the public at large supported the Capobiancos in their fight for Veronica. And those who supported Brown in this often wondered what others saw that maybe they weren’t seeing. In their minds, they knew the thought of taking this child from her biological parents and giving her to some adoptive couple simply because that couple felt they wanted her more was just reprehensible. And come to find out, it WAS all a sham. There weren’t thousands of people who liked their page and agreed with their views. There were just plenty of fake profiles and bought numbers who boosted their ranks. If their ‘likes’ had been authentic, their most popular city likely would have been Charleston, SC seeing that is where the Capobiancos are from and where their support base originated. You see this is true when you then compare their info to the SOG page supporting Brown whose support base came primarily from his home state of Oklahoma and from Native Americans. Their most popular city then was Tulsa, OK as would be expected. But Istanbul? Could that even possibly be real? A quick search of the topic of Baby Veronica doesn’t even return results in Istanbul. One can see articles about vacationing there or car seats for babies in Istanbul taxis and other equally mundane topics but this case never even dotted the radar there making the fact that it’s the SVR page’s most popular city even more ridiculous. It really makes one wonder, if they lied about this, and they lied about so much of this story, then what else were we lied to about? But it leads us to wonder, if one builds their foundation on lies, builds up a house of cards if you will, can they really prevail? We’d all like to think ideally that justice will prevail in the end but was that the case here? Or, with the foundation of this all being lies backed by loads of money and lifted off the ground by a woman who was rather savvy with marketing, further bolstered by political ties and helped along by the couple’s socioeconomic and racial background, was this a losing battle for Brown and his supporters from the start? Can one really buy their way through life? Many couples wait years to adopt. Many still aren’t successful and find themselves having had several adoptions ‘fall through’. And many similar cases wait months if not years between hearings to determine their fate. But not the Capobiancos. No sir! They netted a baby on the first try (IVF attempts excluded and speaking strictly on adoption). They were given front row seats to her birth, a moment Maldonado denied Brown. The ICPC approval was rushed right through allowing them to take her home. They didn’t worry about those pesky details like if her father spent sleepless nights wondering about her or not. And then when he came calling for his child, they bought the best defense money could buy. They chipped away at laws protecting endangered cultures and minorities. They even looked good doing it claiming they were wanting equal rights for all in adoptionland rather than saying they were simply trying to open up yet another market for adoptable children. They got a pretty good deal as these things go too. They were able to buy themselves the attention of a couple of the Supreme Court justices by retaining those attorneys who were on an elbow-rubbing basis with the justices. So where does all that leave us now? Where that leaves us now is that the Capobiancos have been successful at destroying Native protections, in destroying any idea of fairness we had left, of destroying any notion of justice we had left and any faith we had in our justice system. It’s shown other couples they too can do the same, they too can have their pick of the litter regardless of whether or not the bio parents want to keep their children for themselves. In fact, they’ve destroyed the idea that a bio parent has a right to raise their own child. They’ve drawn up the blueprint for cases to come. And while some may say that is exaggerating things a bit, I’d challenge them. One need only to look to the case of Baby Deserai to see how accurate that statement is. With an Oklahoma ruling already in place calling for Desirai’s return, the 60’s something Bixlers of SC refuse to return her. They’ve continued to move forward with their adoption there despite a loving biological family who want her and despite the fraudulent nature by which they obtained her. Soon the state of South Carolina will begin to throw their weight around and they’ll claim they’re the only authority with regard to her case as well. UPDATE: These people change faster than we can keep up with. After reporting their bought likes here, immediately their page changed to this…. We can’t explain how they made the sudden change but we’ve noted it regardless. 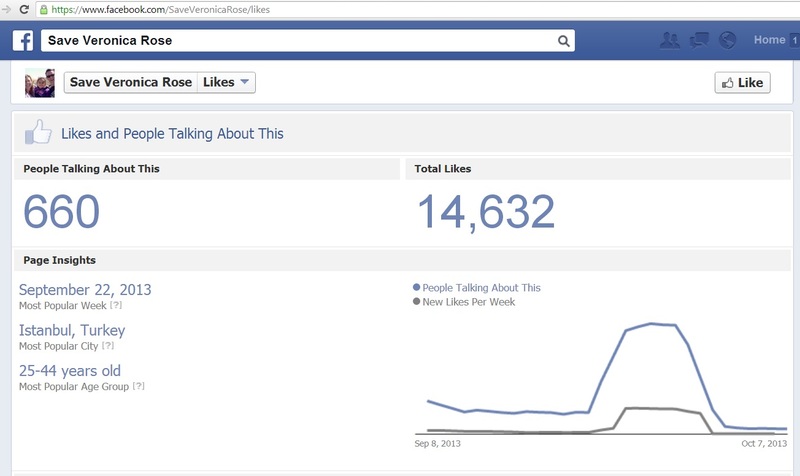 However, we’ve also noticed that the number of people talking about their page went down as well. There has certainly been some fast doctoring happening. Maybe Mr. Caricofe has been able to show them a few tricks given he is the resident computer guru there at Munday’s Trio Solutions. Or it could simply be that they’ve changed the home city on most of the fake accounts liking the page to Charleston, South Carolina.